You spend ages creating a great opt-in bonus that has heaps of value for your target audience and then hardly anyone signs up to get it. Or you research and test a product idea, everyone says they want it and then when you finally launch it, people click on your sales page but don’t actually buy. If you’ve found yourself in either of these two situations – and let’s face it, we all have – you have a problem with your marketing. So let’s look at an example of a customer journey I went on a couple of weeks ago to see what works and what doesn’t and why. 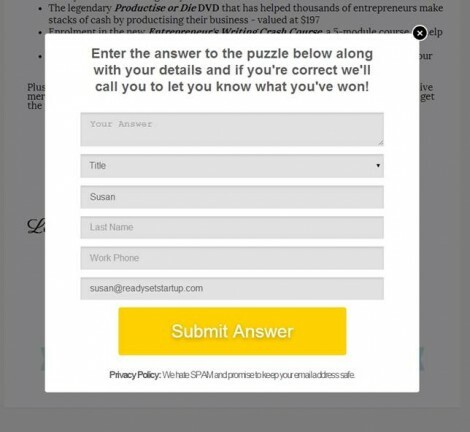 This one is for getting potential customers to opt-in to an email list but the principles are exactly the same to move people to a purchase. 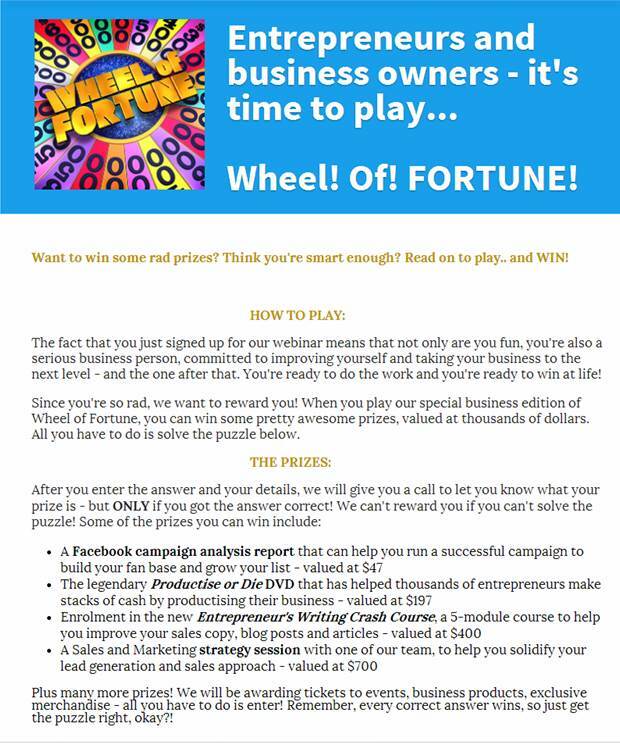 We’ll look at all the different elements of a real life sales funnel and pull it apart to learn from it. Ready? 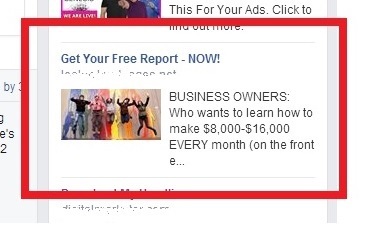 I was online the other day and came across this ad on Facebook. 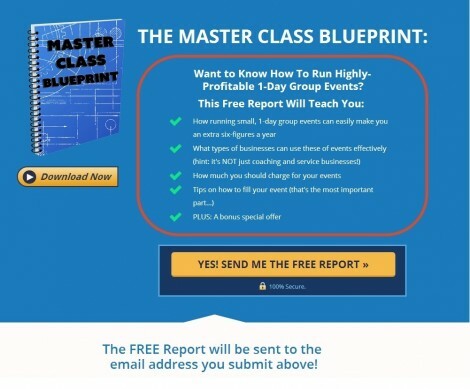 I clicked on it (which I rarely do) – because it promised to tell me how to make and extra $8,000 – $16,000 a month, and who doesn’t want that right? So, first point, the advertiser (who shall remain nameless) did a great job with this ad. They put something I want in front of my face and got me to notice it and click through. It’s a great first piece to their sales funnel. In a well constructed sales funnel, each piece should be designed to continue the journey and move the prospect through to taking an action. However, there’s no continuation of the journey here. They actually start me on a new one. There’s no mention of $8000 – $16,000. That’s what I’m really interested in. 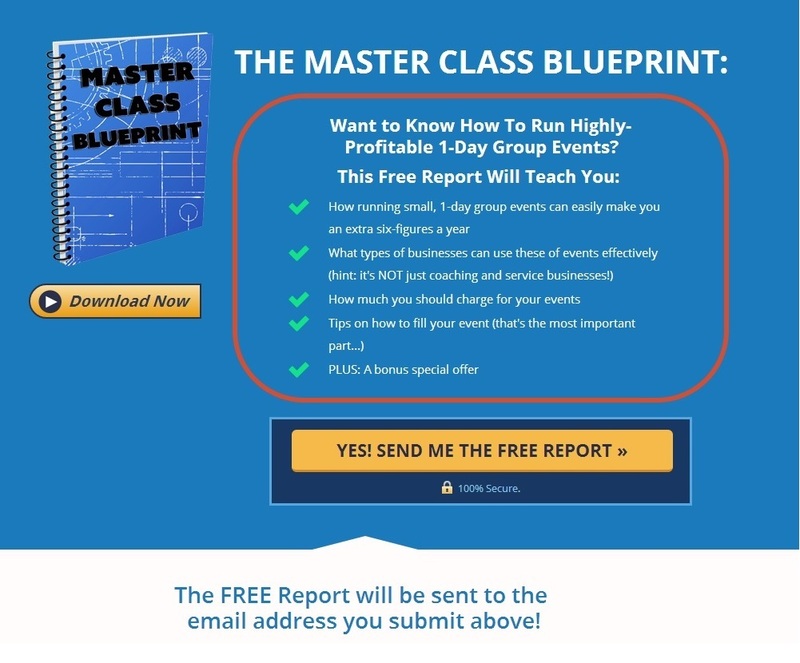 Instead what I’m offered is a free report: The Master Class Blueprint. I think, “Ok, not what I was expecting and I’m not sure how I’m going to make $8-16K but maybe they will tell me in the report.” So, giving them the benefit of the doubt, I sign up. The problem here is that the marketer is causing a disruption in my thinking and they are leaving me to make all the connections myself. Not only do I have to do all the brain work – this breaks my trust. It makes me wonder if they are credible. Can I really believe what they say, if they didn’t deliver on their first promise. Do you see how this works? They definitely should have mentioned what was promised in the ad. 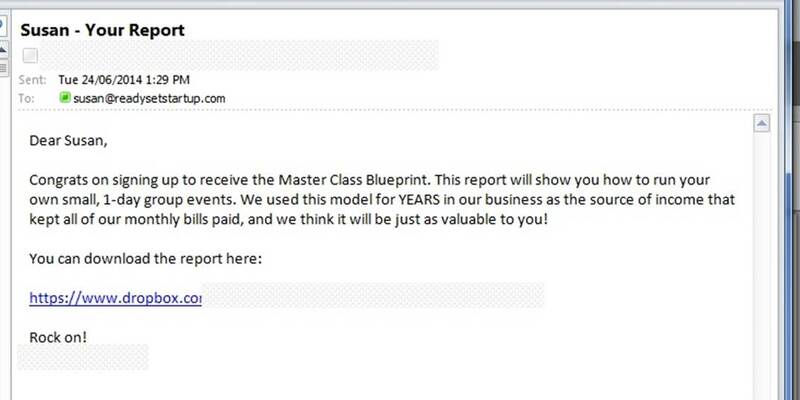 Kept a consistent message to build my trust that they are credible and it is safe to give them my email address. Using the same image and colours that were in the ad would also have helped communicate that consistency. This page looks totally unrelated and different. 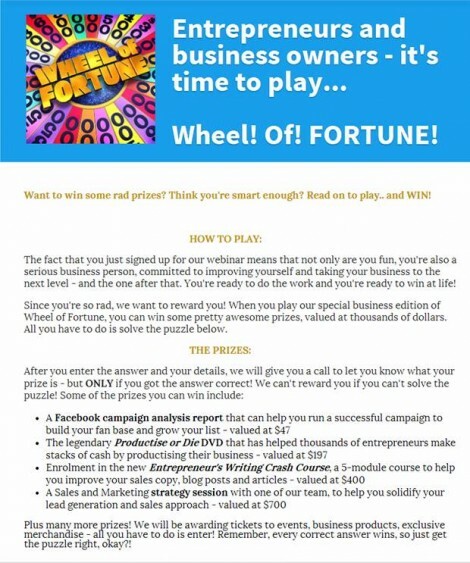 Not only is this page completely left of field, it also offers me prizes that I’ve never heard of before. WTF? And what’s more, if I check out the sign up button at the bottom of the page, they want me to give them all my worldly details. The opt-in button on the ‘thank you’ page. They might as well ask for my bank account details too! Each piece of the sales funnel should build trust and rapport with the potential customer. Therefore, the response I had to this page is a bad, bad response from the point of view of a marketer. Not at all what you want to elicit from a potential customer. The marketer has now made my experience more like a maze than a journey and completely broken my trust. Again, this page looks completely different and the message has no connection to the ad I originally clicked on. The most common (and courteous) response to someone opting in to your newsletter or buying your product is to give them a thank you – and deliver what you have promised. 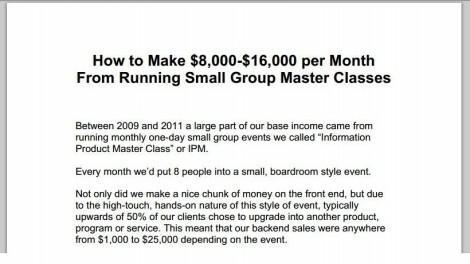 Email follow up – still no mention of my $8000 – $16000 a month. Still no mention of that $8-$16K a year. Just this report that I didn’t want anyway. Then when I click through to check it out, finally, there it is. Finally, here it is. 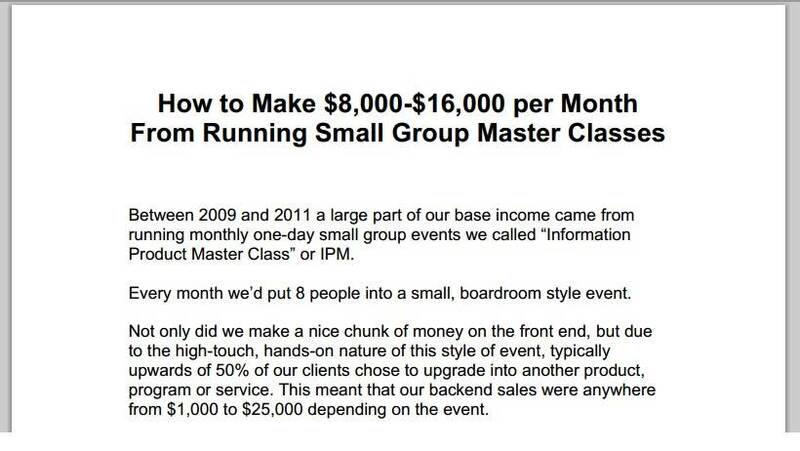 But after all that, how does the marketer know I would be interested in running group master classes. They should have qualified this earlier. Do you see the problem here? I had to go through 6 steps to get the answer that the FB ad promised me and nowhere along the way was it mentioned again. I’m a bit strange. I like to check out how people do their marketing and learn from that. If I didn’t, I wouldn’t have even filled out the first sign up form. 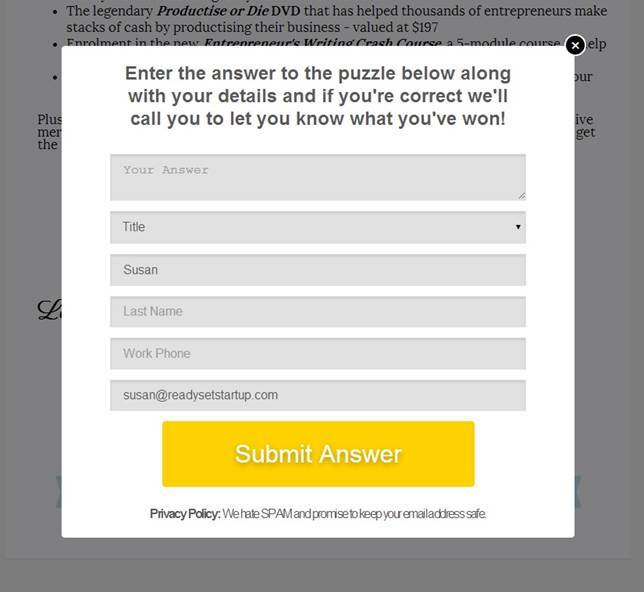 The marketer would have lost me out of the sales funnel before I’d even got going and the disconnect that each piece after that caused made it more and more likely that I would click away without taking the action they were hoping for. None of the strategies used are bad. They could all work very well in a sales funnel in the right context. It was the lack of continuity in the marketing message that made me feel like I was being sold to and made me distrust the marketer. The marketer hadn’t thought through my experience as a customer. They hadn’t planned a nice smooth journey for me. Instead they led me through a maze which created a lot of confusion, uncertainty and distrust. Not emotions that are going to put me into an optimum buying frame of mind! They didn’t deliver on the initial promise they made straight away. The effect of this was that it cut across rapport, broke my trust and made them lose credibility. The visual and written messages weren’t consistent with each other and from piece to piece throughout the journey. They asked for too many personal details for a first interaction before they had created trust. Things they should have done differently in the sales funnel. Created trust before they asked me to do something else for them. The journey has to be logical, create rapport and engage your prospect’s emotions in a positive way. Anything that makes a customer go ‘huh?’ greatly increases the chance of them clicking away. THAT’s why continuity and thinking from your customer’s perspective and goals is so important. Let me know in the comments if, next time, you’d like to look at a marketing funnel that’s done well and see why it works and how it will get you better conversions. Top image used courtesy of Laura Dinneen under Creative Commons license. Great insight Susan, thank you. I am in the process of creating landing pages and a journey for my community and a timely reminder to stay focused at each step! Glad it helped Lauren. I’m sure you’ll do great. OK – this gave me a good laugh. First, because it was so outlandish, and second (this was a relieved laugh, obviously) because it wasn’t my funnel! Thanks for your sharply observed insights – they are well worth noting… and Buffering. This is a great example of complete disconnect between promised value and delivered value Susan. It’s extremely important, even if you product is only half as good as the competitor’s to have a consistent message from the beginning to the end of the customer’s journey. Thanks for sharing this with us!